A cooperative game of fire rescue. The call comes in... "911, what is your emergency?" On the other end is a panicked response of "FIRE!" Moments later you don the protective suits that will keep you alive, gather your equipment and rush to the scene of a blazing inferno. The team has only seconds to assess the situation and devise a plan of attack - then you spring into action like the trained professionals that you are. You must face your fears, never give up, and above all else work as a team because the fire is raging, the building is threatening to collapse and lives are in danger. You must succeed. You are the brave men and women of fire rescue, people are depending on you. This is what you do every day. 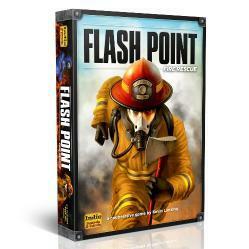 Flash Point: Fire Rescue is a cooperative game. All the players are on the same team and everyone either wins or loses together. To win, the players must rescue the victims trapped inside a burning building before it collapses.